Take a ride into the 1800's by stepping aboard the Gorge Sternwheeler from the docks in Cascade Locks. 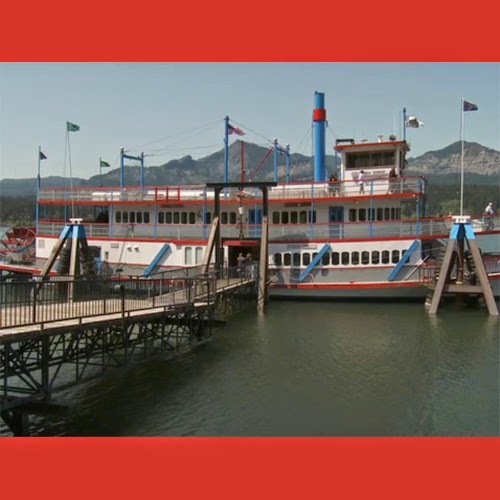 The Gorge Sternwheeler functions as a paddlewheel boat did in the 1800's, providing you a historical experience. By joining the Sternwheeler for a ride on The Columbia River Gorge you'll enjoy the unique point of view of the Gorge reserved for the river's wildlife and fisherman. Don't deprive yourself the experience of riding the timeless Gorge Sternwheeler and enjoying beautiful views of this Oregon Wonder, that is The Columbia River Gorge. Learn details about the Sternwheeler below. Folks come from all over to step aboard the Gorge Sternwheeler and "Capt. Tom" makes sure the experience is spectacular! As he likes to say, "It's the most important part of my job!" "There are no propellers, no bow thrusters so it's all about wind and current. The boat responds the way a paddlewheel boat would have in the 1800s," he said. Tom Gramblett stepped aboard the Gorge Sternwheeler in 1982 just after it was built and delivered to Cascade Locks. He worked his way up the ranks to become one of two skippers to guide the Sternwheeler on daily tours. He said that sternwheelers arrived on the Columbia River in 1850 during a time when shipping goods and people on the giant waterway was the only practical means of transportation.